Over the last years, the subject of maintenance has clearly gained significance. Not surprising, after all complexity and degree of automation are increasing continuously with modern processing machines. Forward-looking strategies reduce the risk of malfunction and down times, increase the service life of machines and thereby ensure constant production quality. 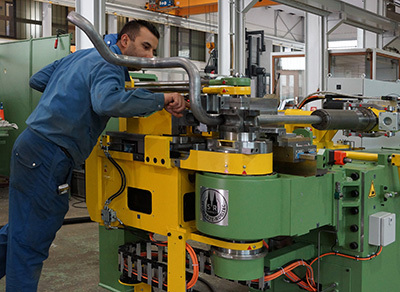 The Tube Bending Machine manufacturer Schwarze-Robitec offers users a comprehensive service â€“ from maintenance and inspection to repair and spare parts supply and all the way to modernization. If a high-tech processing machine comes to a standstill as a result of a malfunction, it quickly gets expensive. In particular when customer production deadlines cannot be met as a result and if there are contractual penalties. That’s precisely why many companies rate maintenance no longer as tiresome costs instead as a central factor of success. The bending specialist Schwarze-Robitec meets this need of increased investment safety with a comprehensive service concept. After all, the company’s high-quality tube bending machines are designed for run times of more than 20 years in continuous operation. So that the machines operate reliably throughout their whole lifecycle, JÃ¼rgen Korte, Plant Manager at Schwarze-Robitec advises conducting a regular machine check-up which comprises maintenance, inspection and service measures. “A tube bending machine should be serviced at the latest approx. every 5,000 working hours,” says Korte. “Otherwise the risk of undesirable surprises will rise exponentially.” Checked are, among other things, the mechanical states and precise positioning of guides, bearings and spindles as well as cables, pumps, valve functions, switching devices and software. If it is a hydraulic system, there is also a check for tightness and leakage safety. Possible are also software updates, comprehensive weak point analyses, staff training and other customer-individual measures.